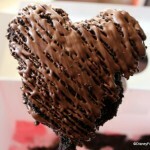 Top 4 Disney Chocolate Goodies to Share With Your Valentine! We can’t let this day go by without thinking dreamily of all the ways we’d be celebrating if we were lucky enough to be in Walt Disney World Today! Like chocolate ganache, maybe? 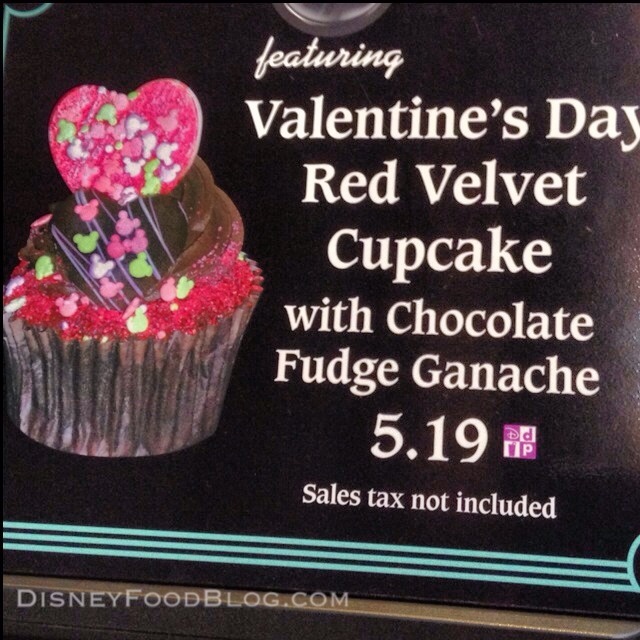 Here’s a fun holiday cupcake found at many Disney’s Hollywood Studios restaurants right now! 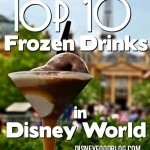 Let’s check out a few more awesome ways to celebrate the Disney Food Blog way! 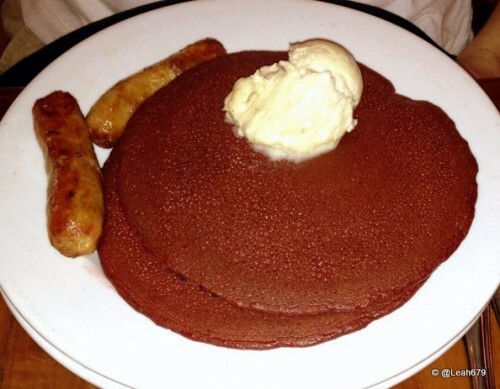 Every year, these gorgeous pancakes — topped with cream cheese icing!!!! — make their appearance at Kona Cafe in Disney’s Polynesian Resort for a few weeks. Today’s the last day you can get ’em this year, though, so head on over! One of my favorite under-the-radar dining spots in Disney World is the Plaza Restaurant in Magic Kingdom. Affordable by Disney standards, they have some delicious dishes. AND your view as you dine if you’re lucky? Cinderella Castle! So how could you go wrong for a hassle-free romantic date night? While I’ve enjoyed most everything I’ve ordered here, hands down my favorite menu items are the Hand Dipped Cookies and Cream Milkshakes. They’re incredible! They come served in those heavy, old-fashioned, footed glasses that you can only get in soda shops of our childhood! Or maybe you think there’s no better date night than a stroll around World Showcase in Epcot. With stunning views, charming shops, fun attractions, and delicious eats, I couldn’t agree more! But after you’ve shared a bowl of Spaghetti e Polpettine at Via Napoli, or perhaps a luxurious French dinner at Monsieur Paul, save a little room for dessert. And my suggestion is a walk over to the Germany Pavilion for a stop at Karamell-Küche. This little German-inspired sweets shop is home to some of my favorite Epcot indulgences. 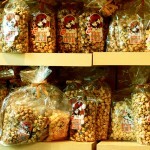 Snag a bag or two of their caramel popcorn for the road. 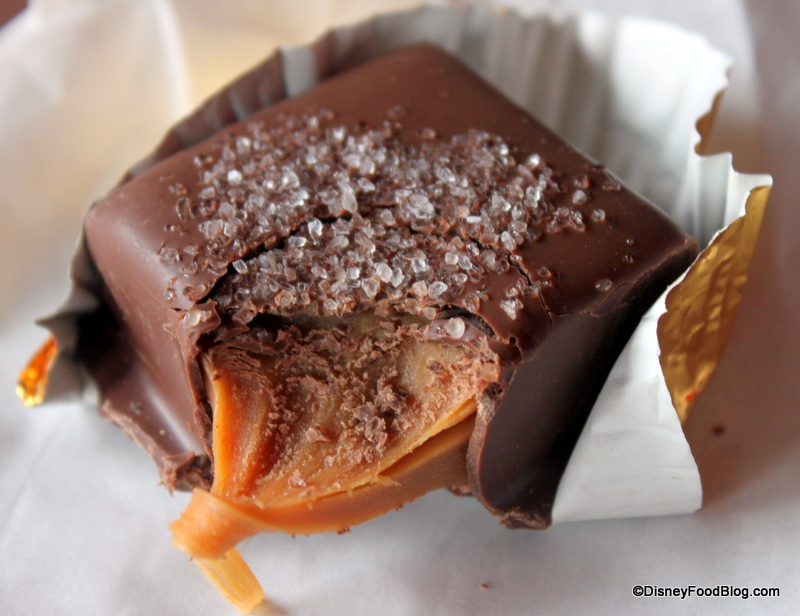 But for sharing with your special guy or gal, try the Chocolate Covered Sea Salt Caramel. 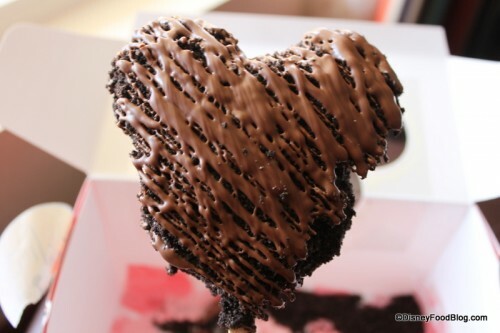 Because you’ll know it’s true love if you can actually share this heavenly treat. Come to think of it, you probably should just go ahead and get two of them. For the sake of your relationship. Teamwork! Anyone who’s been on the merry go round of relationships knows that success comes with a little planning, a little give and take. So what better way to celebrate the special day than with a fun project? Because this project involves chocolate. So you have your incentive for successful completion built right in at the beginning. It’s time to head to Goofy’s Candy Company at Downtown Disney, and work together to make your very own custom treat! 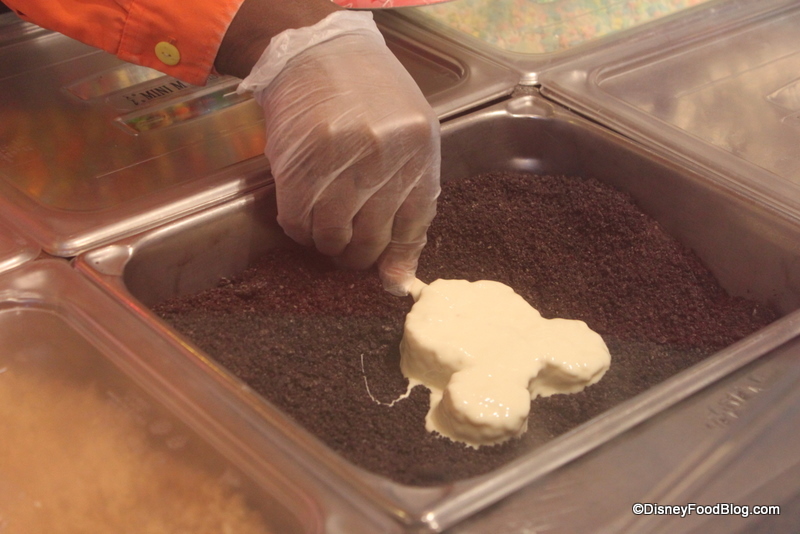 Just pick your treat, dip, sprinkles, drizzle, etc., and watch while the Cast Members make your chocolate dreams a reality. My Krispie, Bathed in White Chocolate, Gets Dunked in Oreo Crumbles! You’ll head out with one perfectly delectable treat. That is, if you make it to the door before digging in. Last year, the talented Cast Members at Goofy’s had some extra pink and red pixie dust up their sleeve for Valentine’s Day. Wonder what they’ll come up with this year? 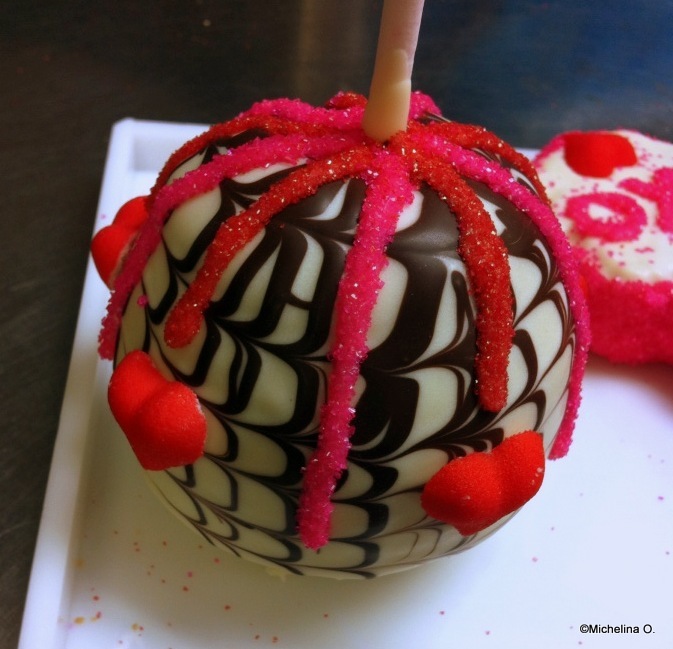 Valentine’s Day Apple at Goofy’s Candy Company! So skip the veggies and have extra chocolate, I say! What are your best suggestions for Valentine shareable chocolate this V Day? We want to hear your ideas in comments below! 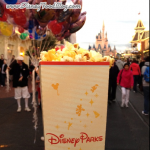 « Mickey’s Toontown “Restaurant Tour” at Disneyland! I’m heading to Disney in two weeks, and I can’t manage to snag a reservation at the Plaza Inn Restaurant. I’ve tried for every hour of each day and can’t find a seat for even one. 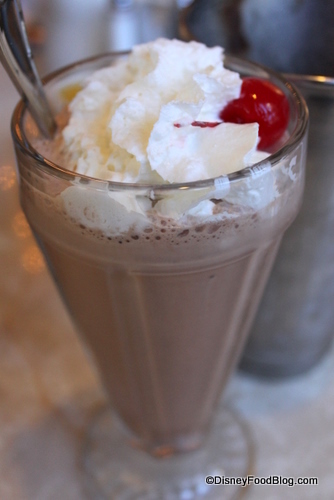 I just need to get in to have that milkshake, as I plan on doing the milkshake crawl on one of the days there. It’s very frustrating. I asked on my last visit, and no, they won’t let me order a single milkshake without a reservation. Apparently they’d rather tie up a table for 20 minutes so I can come in, get seated, wait for the server, place my order for a single milkshake, wait for it to be made and served, pay my bill and leave, at which point they can clear and reset the table for the next guest. What a waste of time for everyone. Oh well, it has to be done, so I’ll do it their way. Jeff. We can always get a walk up for the Plaza at 11:00 am or so. We just head over there even before they open sometimes and they give us a pager and we return when the restaurant opens at 11am. We like the early lunch with our little ones. I’ve also had great luck snagging a reservation the night before. Good luck. We love the Plaza and went two times on our last trip. I was amazed to figure out the create-your-own Mickey Rice Krispies treat was a snack credit. Best use of a credit ever! It was delicious. We ate it in three different stages, it was so huge, haha. Jeff, I believe the Plaza Inn will be closed for refurbishment 2/17 through 3/15. Maybe call to confirm? Dana, I looked it up online, and you are correct. Thanks for pointing that out. I would have been very disappointed to find that out once I got there. I will have to delay my milkshake crawl for another day. I love the knowledge around here! Back in November they no longer carried the salted caramel. Has it returned? Joshua, it comes and goes, but we’d sure like to see it stay all the time!